Galvanism is a medical treatment that involves the application of electric currents to body tissues in order to stimulate the contraction of muscles. First experimented in the late eighteenth-century by Luigi Galvani (1737-1798) who investigated frog legs twitching once sparked by an electric current, galvanism was believed to be a miraculous application of scientific prowess and capable of curing all sorts of medical disorders. It even had the capacity for animating a corpse, as narrated in Mary Shelly’s Frankenstein! Aurists certainly saw the benefits of galvanism in cases of deafness they diagnosed as caused by paralysis of the auditory nerves. The paralysis prevented sound vibrations from being transmitted properly through the tympanic membrane (eardrum). Several nineteenth-century treatises on aural surgery discussed how galvanism could cure deafness by stimulating muscular action necessary for restoring the auditory nerves to function in the transmission of sound. 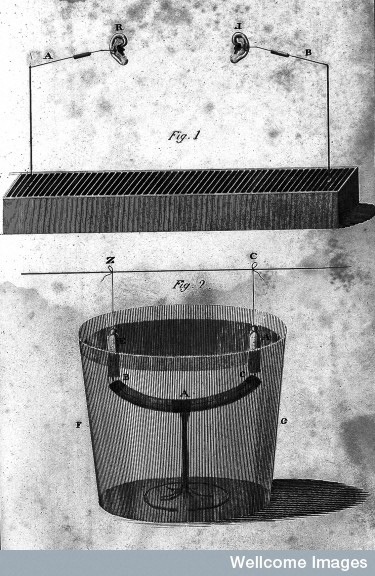 In his Elements of Galvanism, in Theory and Practice (1804), Charles Henry Wilkson outlined an apparatus for safely applying an electric current to cure deafness. When it is ascertained hat the deafness is of that particular nature, in which galvanism may be usefully employed, p…two conducting wires, A & B, at end of each which is a small plate of ivory, about one inch & half in diameter. Through center of the plates is passed a silver wire, with a small ball at its extremity. To be insulated, silver wires are about an inch in length, enclosed, with each of them in an ivory tube. Inside of right ear moistened with water, and ball is introduced the ear, with the ivory plate preventing the wire from penetrating too far. Similar procedure on left ear. Once inserted, completion of the circuit is conducted by bringing the end of the conducting wires into occasional contact with the trough (the plates between A and B). I allude to this vaunted remedy from the specious character it presents, and the conquest frequency with which persons suffering from deafness are tempted to give it a trial, in many cases a prolonged one, to find themselves in the end but disappointed dupes. The error which the majority of people fall into with regard to the cause of their deafness is, that some defect exists in the nerve of audition, and therefore galvanism cannot fail to cure, and this popular error is taken advantage of by quacks to cry up its application as a specific for all cases of deafness. Galvanic current, Pennefather asserted, “cannot have the slightest remedial influence; on the contrary, is more likely to exercise an injurious tendency.” He further explained that he was not decrying the valuable agency of medical galvanism, nor contending that it was not beneficial for particular cases of deafness. Rather, he warned its application should only be ascertained by a proper diagnosis and undertaken by skilled and trained aurists. It was not, nor should be, a catch-all cure for all sorts of deafness.